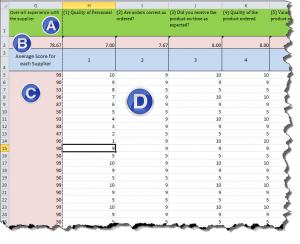 I have developed a prototype quality management Excel spreadsheet tool for evaluating, scoring and approving suppliers. Be sure to join our Quality Managers User Group to download the Excel workbook and the workinstructions, which are described below. Click here to Join our User Group or Download our resources. 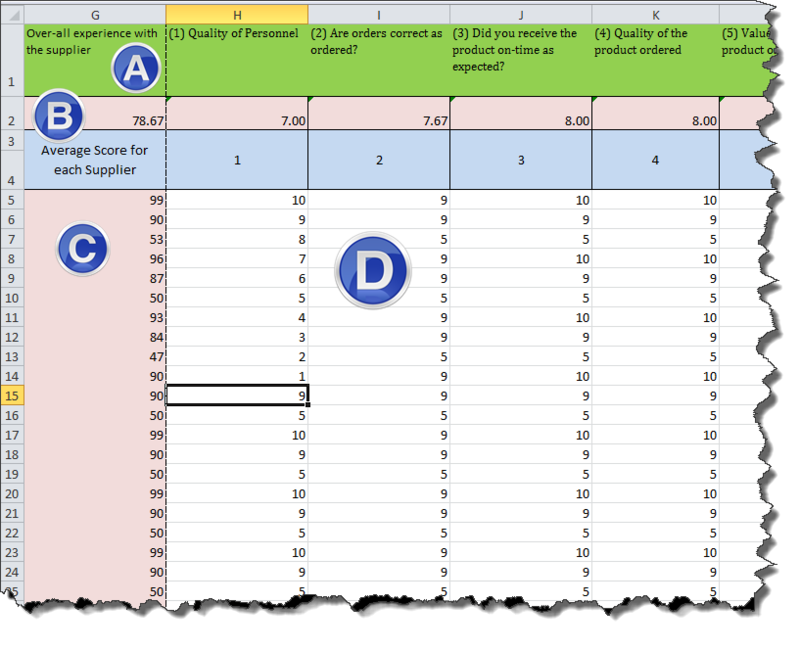 The following table describes the features in the Supplier Evaluation Excel Workbook, which is shown above. The Active Suppliers field is automatically tallied when a 1 or 0 is entered into Column A. A supplier can be marked active or inactive by entering a 1 or 0 into Column A. 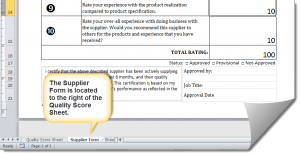 The Minimum Score Required to be APPROVED field is user-defined and intended to mean the minimum scored needed to indicate an approved supplier. The Over-all Experience with a supplier is an average score of all suppliers. Enter up to 100 suppliers for evaluation. Enter the date of the last evaluation and the next evaluation date is automatically generated. 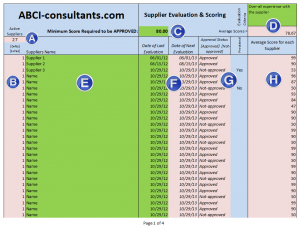 If the (H) Supplier Score in less than the (C) Minimum Score Required to be APPROVED, then the (G) Approval Status automatically becomes ‘Not-approved’, else the Status becomes ‘Approved’. The ‘Provisional’ column to the right of the Approval Status column is meant to be used for indicating that a supplier ‘Not-approved’ may be used as needed. The average individual Supplier Score. The image below shows the Excel columns not intended for printing. 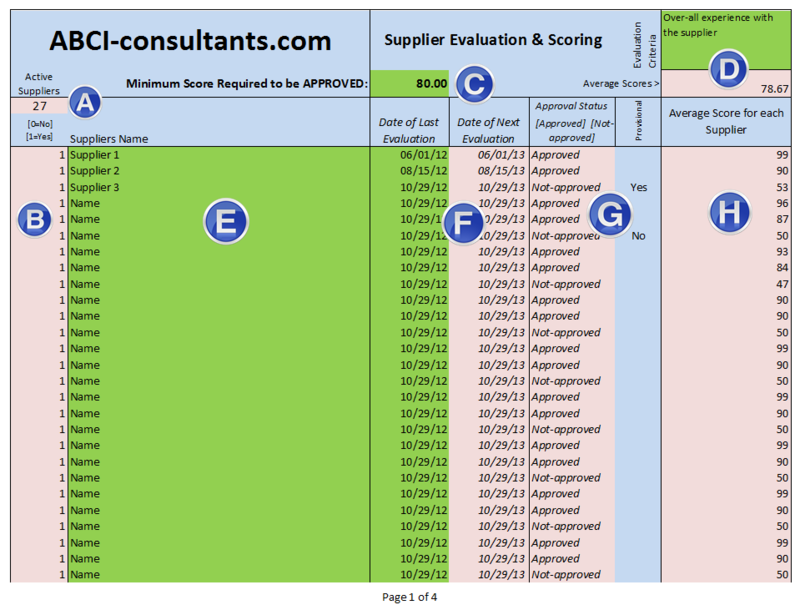 The Supplier Evaluation Criteria should be entered into row 1, columns G1 through Q1. The over-all average score and the average score for each supplier is displayed on row 2, columns G1 through Q1. Section (C) shows the individual scores for each supplier. Section (D) shows the individual criteria score for each supplier. 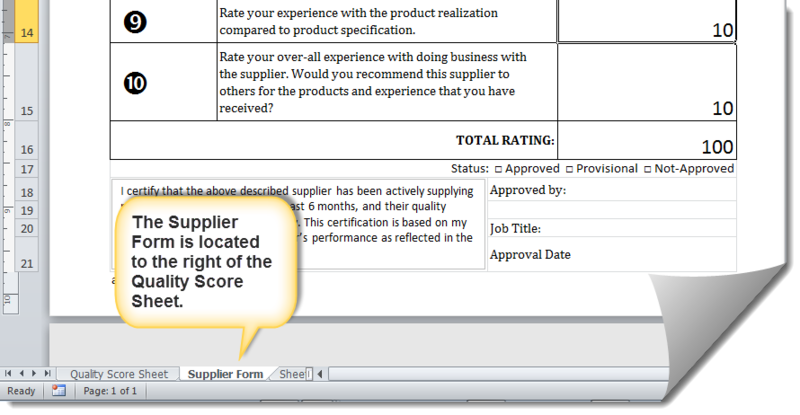 A Supplier Evaluation form is located in the Excel Workbook, Supplier Form tab/worksheet. Complete the survey below to provide an evaluation of the supplier. Using a scale of 1 through 10; a 1 would indicate that you are very dissatisfied with the supplier, a 5 would indicate indifference and a 10 would indicate that you are very satisfied. Rate your experience with the supplier’s Sales personnel. Were the personnel prompt, professional, and courteous? Rate your experience with the receipt of orders. Are orders correct as ordered? Rate your experience with on-time delivery. Did you receive the product on-time as expected? Rate your impression of the quality of the product ordered. Rate your impression of the value received for the product ordered. Rate your experience with the packaging and intact delivery condition. Results of Supplier Quality Survey. Rate the experience with the supplier’s Customer Services. Were the personnel prompt, professional, and courteous? Rate your experience with the product realization compared to product specification. Rate your over-all experience with doing business with the supplier. Would you recommend this supplier to others for the products and experience that you have received?